The WikiReader, a small handheld device that contains more than three million Wikipedia articles, just got an update to add the entire Project Gutenberg library of ebooks. The update can be downloaded and added to the WikiReader by visiting the official WikiReader website, or you can sign up to have the update mailed to your house since the device is designed for those that don’t have access to the internet. With the WikiReader, articles are stored on a microSD card. The articles get updated quarterly via firmware update. The device uses a monochrome display and runs on two AAA batteries that can last for up to 12 months. It has a touchscreen with an on-screen keyboard and three physical buttons for Search, History, and Random. Once the microSD card is loaded with the Project Gutenberg ebooks, the WikiReader uses the same system as it does for Wikipedia or WikiQuotes for searching books by keywords, retracing your user history, and jumping to random titles. Since it uses a touchscreen, you scroll through articles and activate hyperlinks using a finger. There are options for adding languages, dictionaries, and other wikis to the WikiReader’s microSD card. 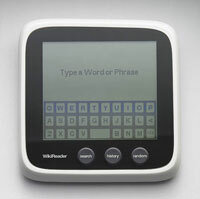 The WikiReader sells for about $99 from several websites. Right now it’s $70 on Amazon.